Created from our highly praised workshop series, Income Tax & Record Keeping for Child Care Providerts is now available on CD. For many family dayhome providers the very thought of doing their income tax is nauseating. 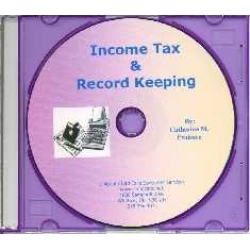 For those who can't afford an accountant or tax advisor (and who can these days?) it's mind boggling just trying to understand what is and what is not deductible. Add to that the frustration of trying to figure out which forms to use and who to contact for information and you can see why a vast majority of caregivers prefer to keep their business "under ground". -- Sample Tax Forms - U.S.
-- and tips by the dozen to help you get the maximum legal deductions for your business. And that translated into more money in your pocket. And we can all use that!